Community Caves are just another great reason to explore Spearfish Canyon. These little waterfalls create some really beautiful ice formations in the winter. The caves are only a few miles into the canyon if your are traveling from Spearfish. You’ll want to watch for mile marker 13 and park in the pullout on the right side of the road just after the marker. 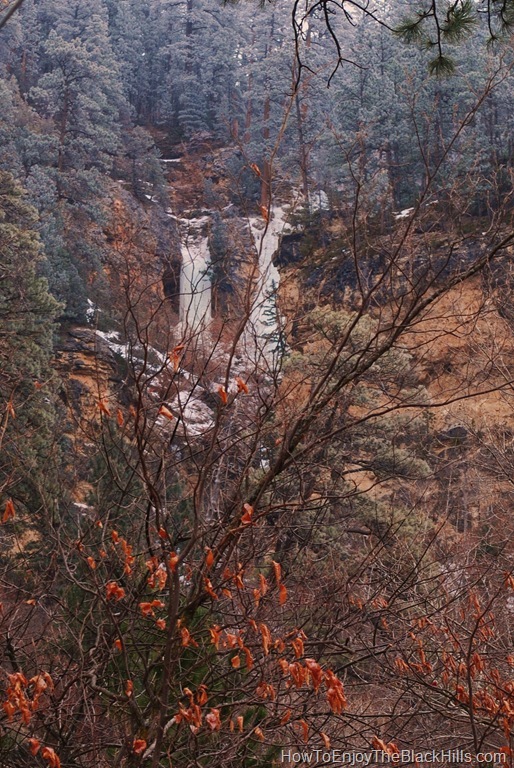 You don’t have to hike up there to catch a glimpse of the falls in the winter. Just before mile marker 13 if you look to the left you’ll see the falls. To get to the falls you’ll cross the road and and cross the creek. You’ll see the well worn trail that heads up the draw and will take you to Community Caves. The trail is pretty steep and if your going in the winter time there is a pretty good chance that the snow packed trail may have turned to a sheet of ice. So don’t forget your crampons . I forgot mine and spent most of the trip back down on my backside. 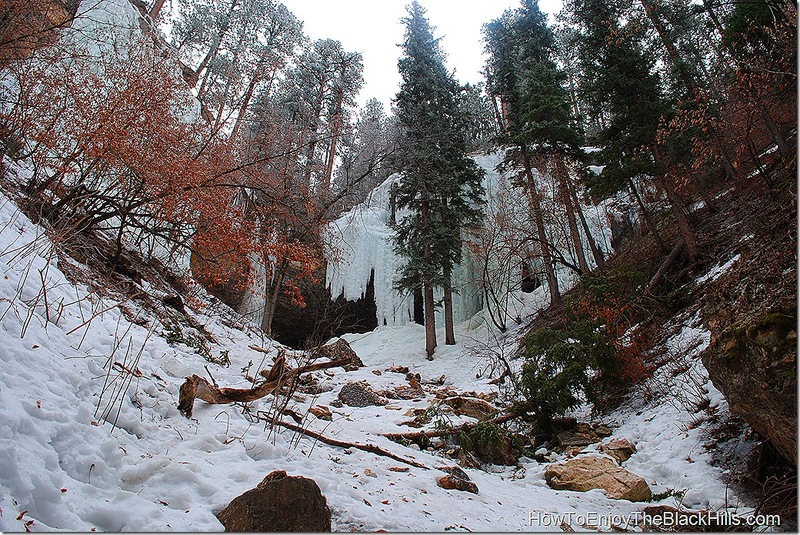 Winter hiking is Spearfish Canyon is total different then summertime. Everything looks different and it is easier to see the rock walls of the canyon without the leaves on the trees. Since most of the canyon is public land hiking is pretty much unlimited, however, here are some great trails you should check out. 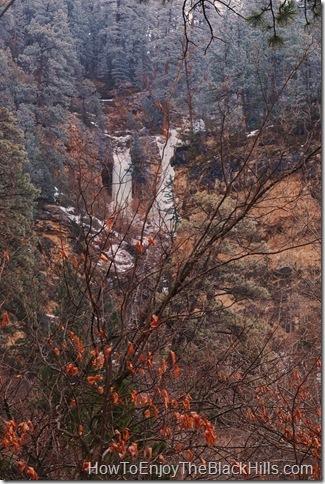 76 Trail – The trailhead is near Spearfish Canyon Lodge and it takes to the top of the canyon for some amazing views. Iron Creek – Summer or winter a beautiful hike. Roughlock Trail – An easy hike that takes you to Roughlock Falls. Little Spearfish Falls Trail – Very short hike that will take you to Little Spearfish Falls. There are very few straight roads in the Black Hills and for that reason I recommend you always carry a good map. Black Hills – Northeast, South Dakota Map #751 is my favorite map, it is big enough to read easily and has most hiking trails marked. If you want a guide book, I like both Best Easy Day Hikes Black Hills Country and Moon Mount Rushmore & the Black Hills . They cover the basics and with your map you should be able to navigate the Black Hills really well. There are many tourist information areas throughout the area that offer free maps and information too.